Remember the Alamo! …In Fair Park? Today, on the anniversary of the fall of the Alamo, I bring you news that Dallas has outdone San Antonio by having hosted two Alamos. TWO! Both in Fair Park. The first one was a gift to the city by G. B. Dealey and the Dallas Morning News — it stood stoically at the entrance to the fairgrounds from 1909 until 1935 — and the second one was a rebuilding of the first which was torn down to make way for the the splendor of the Art Deco Centennial extravaganza and lasted from 1936 until 1951. And here I’d never heard mention of Dallas having had ANY Alamos. The idea came from Dallas Morning News executive George Bannerman Dealey. 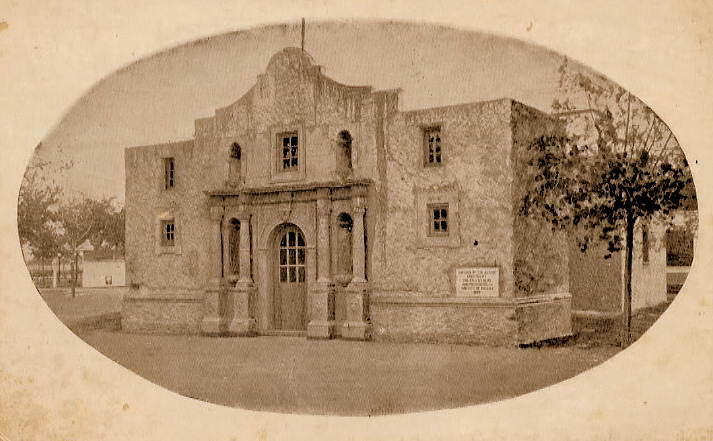 He sent architect J. P. Hubbell (of Hubbell & Greene) to San Antonio to meticulously photograph, sketch, and measure the original structure — this included making note of every stain, every crack, every instance of broken plaster, etc. — in order to reproduce an exact replica of the historical landmark (at half the size of the original). The Morning News offered to pay for and build the replica (the cost was estimated at $5,000) and asked only that it be placed in a primo location (at the entrance! ), that it be open to the public during the day but be available to the DMN people to use for private/company functions after hours, and that the Park Board maintain the building and its landscaping. The Park Board jumped at the gift, and the news of our very own “little Alamo” was met with giddy anticipation. Even the rival Dallas Times Herald was swept up in the excitement and suggested a “Meet Me at the Alamo at the Dallas State Fair” slogan in an editorial. San Antonio and the Daughters of the Republic of Texas (who managed and maintained the historic shrine) were not terribly amused by this, but The News (in the expected torrent of its own self-congratulatory publicity about its magnanimous gift “not to Dallas, but to the State”) humbly insisted that the much, much, MUCH smaller Alamo would only drum up steady tourism of people who wanted to see the real thing. San Antonio and the Daughters seemed to get over it eventually. 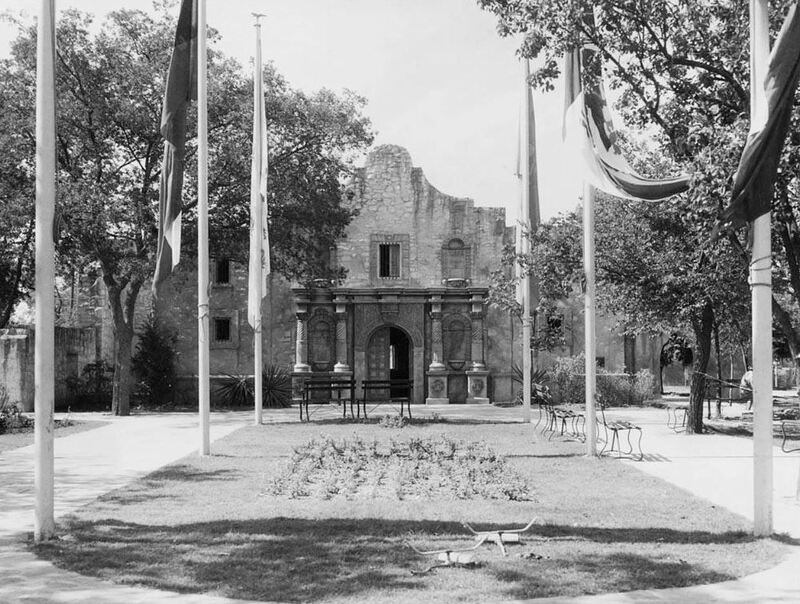 Dealey had made a good point, though, when he said that only a very small percentage of Texans had been able to see the Alamo in person, and this was an excellent way to bring history alive for North Texans. 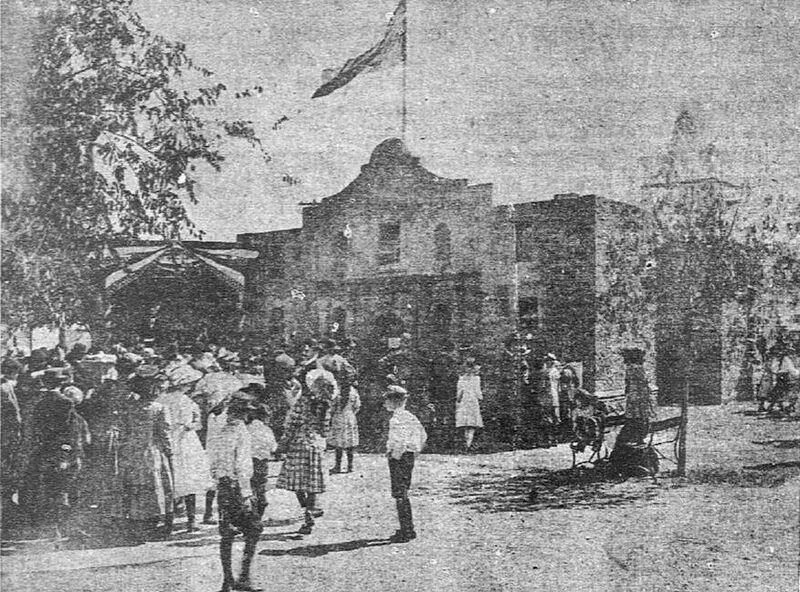 The replica was dedicated on the opening day of the fair in 1909, and curious crowds lined up to see the startlingly realistic reproduction of the building which Mayor S. J. Hay described as being “sacred to every patriotic citizen of the State.” The brand new Alamo (made to look old and worn and battle-scarred) was a hit. In fact, it seems to have been a very popular exhibit for the length of its stay — a total of 42 years. Other than being visited by thousands and thousands of fair-goers and families and schoolchildren, it was also used to house soldiers briefly during both World War I and World War II. It was visited by numerous people who claimed to be related to Alamo heroes like Crockett, Bowie, and Travis, and there were even a couple of instances of visits by 100-year-old men who said they had known Crockett and Bowie when they were children. 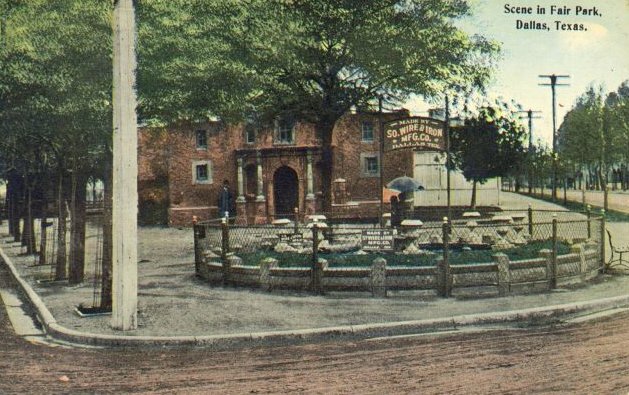 Dallas’ second Alamo (which made its debut at the Texas Centennial in 1936) no longer had its primo location at the entrance to Fair Park, but it at least had a bit of room to breathe. As with the first replica, an architect was sent to San Antonio to bring back exact measurements — this time it was the incomparable George Dahl (if you’re not familiar with his work, you need to look him up). And this time, San Antonio and the Daughters of the Republic of Texas were not happy at ALL: there was a sternly worded petition from San Antonio to the governor and threats to legally force a halt to the construction. Guess they got over it. Again. But eventually, the Alamo fell. It was razed in August of 1951, after years of neglect. Stalwart Texas demolition workers must have blanched a bit at being informed that their job was to destroy the very symbol of Texas heroism and independence. Top postcard from a page on the Watermelon Kid’s great Dallas history site, here. Photo of the “brand new” Alamo in 1936 from the Ryerson & Burnham Archives, Art Institute of Chicago, here.